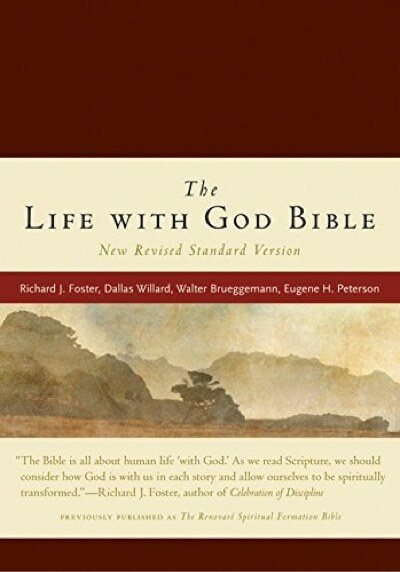 An invaluable 25-page resource listing Scriptures relating to spiritual practices, taken from Life with God Bible. Plus, get Renovaré updates. Five years in the making, The Life with God Bible seeks to recover the dynamics of Scripture for the spiritual transformation of the people of God: past, present, and future. It provides a view of God’s community through history, the ups-and-downs, ins-and-outs of a with-God life. While other study Bibles serve as resources for sermon exposition, higher criticism, or personal devotion, The Life with God Bible helps us capture the reality of living with the Trinitarian community in the ever-present kingdom of God. It accesses the Bible as the primary written resource for informing our minds and transforming our spirits in Christlikeness. Harper Collins has graciously agreed to make much of the introductory and supplementary content available here free. You can explore the content in the articles below, and you can also download the entire Spiritual Disciplines Index in a print-ready eBook! An index of places various spiritual disciplines appear in the Scripture. We are sharing some recently made-available resources from the Life with God Spiritual Formation Bible. This excerpt looks at how we can begin to wrap our minds around the richness of a with-God life. We must consider how we can ourselves come to the Bible and also how we can present it to people in a way that does not destroy the soul, but inducts it into the eternal kind of life. We continue to share our Life with God Spiritual Formation Bible resources with this excerpt from the introduction on ways we can train for the with-God life that the Bible promises and our very souls yearn for. From the Life with God Bible, this brief overview of biblical history helps us grasp how the divine drama took concrete forms in each age as people encountered God. Nathan Foster kicks off 2017 by interviewing long-time Renovaré supporter Mary Russell, 92, who shares her rhythms of reading Scripture and how she listens to God.